The L1 enclosure is a low cost, 304 stainless steel housing for your vertical styple camera. It keeps out dust, dirt and idle hands, as well as providing a high degree of impact resistance. The drillable PG29 cable gland on the back allows you to use most pre-made cables without disassembly and provides a water-tight seal around one or more cables. This enclosure is designed to work with “80/20″ 1500 series or 40mm series extrusions, and includes a pair of M8 stainless steel fasteners for this purpose. The clear lens spacer allows the user to view the lens settings without opening the enclosure. Once the enclosure cover is removed, the user has full access to the lens, taking the guesswork out of changing focus and f-stop settings. The L1 enclosure can handle a variety of lenses. Longer Lens Spacers are available to handle lenses up to 4″ or more in length. 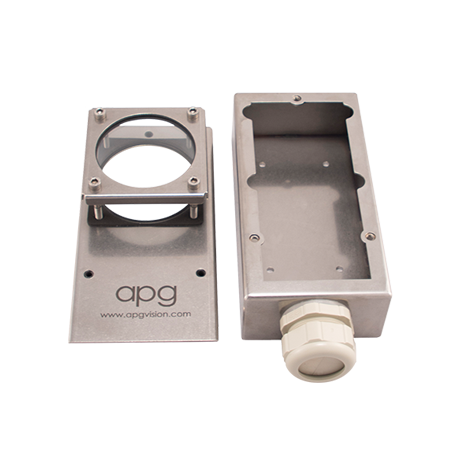 Enclosure is constructed of 16 gauge (lid) and 18 gauge (body and faceplate) Type 304 stainless steel. Lens Tube is polycarbonate. All fasteners are 18-8 stainless steel. Fasteners to mount your camera are included. Fasteners (M8 x 12mm BHSCS) to mount the enclosure to 1.5″ or 40mm extrusion (80/20) are included. Interior size: 2.7″ wide by 1.9″ high by 6.2″ long (not including lens cavity). Lens cavity has a 2.65″ internal diameter. Lens cavity length can be specified.